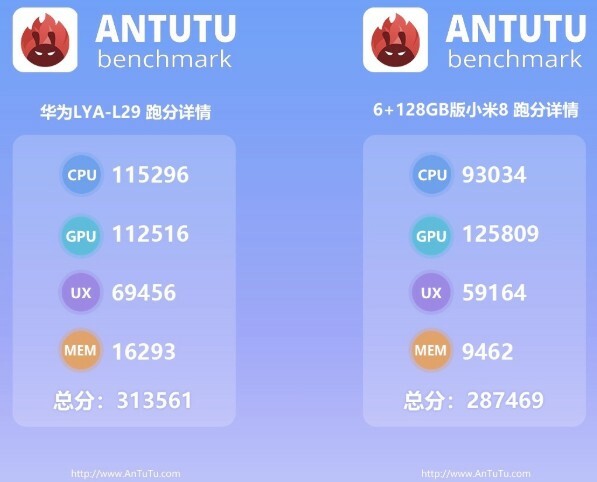 Although the Mi 8 might beat it by around 10 percent in the graphics department, the upcoming Huawei Mate 20 appears to be faster in the other areas, scoring a total of 313,561 AnTuTu points vs. 287,469 for the Xiaomi flagship. The Huawei handset sports a HiSilicon Kirin 980 processor, 6 GB RAM, and 128 GB internal storage. The Google Pixel 3 and Pixel 3 XL handsets should arrive tomorrow, but those who wait might get a better deal in the shape of the Huawei Mate 20. Obviously, we will only know for sure once the Mate 20 hits the market as well. However, if the latest leaks turn out to be accurate, the Huawei Mate 20 will beat the Xiaomi Mi 8 (almost) without breaking a sweat. The Huawei device with the model number LYA-L29 surfaced on AnTuTu with a HiSilicon Kirin 980 processor, 6 GB of memory, and 128 GB internal storage. Its overall score is 313,561, and the individual tests delivered the following results: 115,296 CPU, 112,516 GPU, 69,456 UX, and 16,293 MEM. 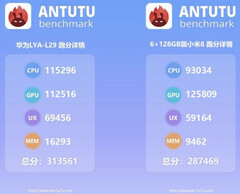 The 6/128 GB variant of the Qualcomm Snapdragon 845-powered Mi 8 scored a total of 287,469 AnTuTu points, seriously lagging behind the Huawei in all areas, except the GPU. The Mate 20 is expected to arrive with a rear camera setup that contains three sensors and a flash arranged in a square shape, but with a fingerprint reader mounted next to it as well. The Pro variant should sport an in-display fingerprint scanner. According to some other leaks, the Huawei Mate 20 sports a notched 6.43-inch display with 2,244 x 1,080 pixels and a 4,000 mAh battery. Its launch is imminent, so we should get ready for it. It apparently won't go above the US$1,000 barrier, but it won't be much cheaper, either.